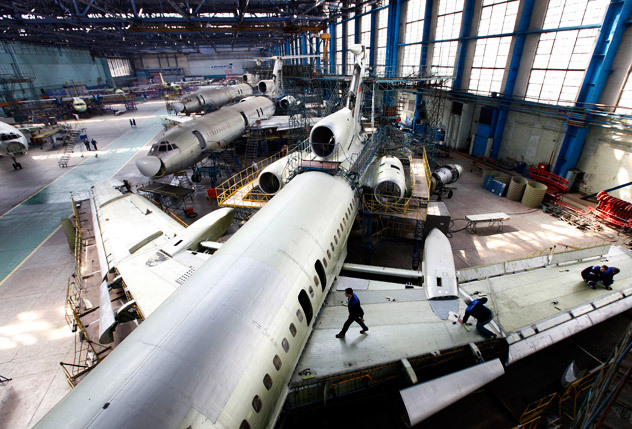 A Tupolev Tu-154M aircraft at the OJSC Aviakor aviation plant, Samara. Russia has become the first of the 34 signatories to the Open Skies Treaty to be able to use digital video cameras on surveillance flights. The Russian-made digital surveillance hardware equipping the Tupolev Tu-154M Lk-1 (NATO reporting name: Careless) and Antonov An-30B (Clank) used on surveillance missions under the treaty has been certificated, the Russian Defense Ministry’s press office has told journalists. Thus, Russia has one-upped by several years such technologically advanced states as the United States, Canada, the UK, France and Italy that still use analog surveillance gear. "Experts from 22 Open Skies Treaty signatory states have confirmed the Russian-made digital surveillance system’s compliance with the provisions and restrictions of the treaty," Sergei Ryzhkov, chief of the Russian Nuclear Risk Reduction Center, told journalists. According to Ryzhkov, serious preparations preceded the international certification. "Over the past three years, there have been about 300 flight and ground tests of the digital surveillance equipment," he said. "The results produced have been shared with all signatory states and the preliminary certification in April this year, attended by 50 foreign experts, resolved all technical and procedural issues." The international certification has taken place at the air bases in Kubinka and Maikop and been attended by 64 experts from 22 Open Skies Treaty signatories. They have conducted ground checks of the surveillance planes, tested the optical cameras and familiarized themselves with the procedure for processing the data gathered during the flight tests. For instance, the near infrared sensor onboard the An-30B was tested and its operating altitude was checked at Kubinka AFB. The cameras equipping the Tu-154M Lk-1 had been tested for two days during the flights out of Maikop AFB. The international certification was designed to check the equipment for compliance with the caps set by the Open Skies Treaty: the cameras’ resolution should not exceed 30 cm at any altitude. According to Klaus Bernander, chief of Sweden’s Open Skies Verification Center, "it was a very good business trip and a Russian success."